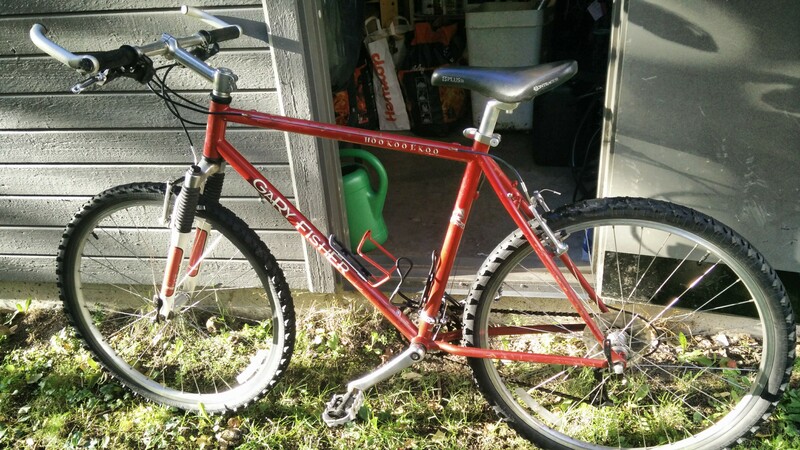 I've given the three-speed 80s Crescent a year, but it was just to flakey and worn. Also I missed using a bike with actual working gears as well as brakes. All these 20+ years with hand-operated brakes and at least 21 gears sets a mark on a person! I have a soft-spot for steel hard-tails. They have a kind of soul that aluminium-framed bikes don't, this steel bike is no exception. This particular bike has a non-leaking and still-working elastomer front shock from Rockshox of the Indy XC persuasion. Definitely not from the top-shelf but works pretty good compared to other supermarket mountainbikes with bling shocks. Overall shape is okay for a daily rider, but I probably won't evoke whistles and shouts at the nearest mtb-track if I show up on this bike. A niceish red Gary Fisher Hoo Koo E Koo! Anyway, when I bought the HKEK it was in so-so shape, but rolling. Rear brake pads were worn down the metal holder, but luckily didn't score the rim too much. Seatpost was badly corroded in the seat tube. Brakes were unadjusted and worked unevenly. The headset was way to low for my poor neck. Reflectors missing back and front. Apart from that, the bike was a little dream to ride after the Crescent! This post will follow what I did to make it rideable. Basically this model is an entry-level bike. Plenty of them around, and has no real restoration value. Given the entry level, not much history about is to be found on the internets. Apart from being a bit rusty and having peeling paint and decals, it was in good shape. Plenty of performance left! Knowing what happens when alumimium and steel meets under a big yellow moon under the influence of water, I started out with generous application of WD40. Next day I tried to adjust the seatpost, to no avail. Using a screwdriver I tried prying apart the frame flaps up top, but the seatpost was definitely stuck. 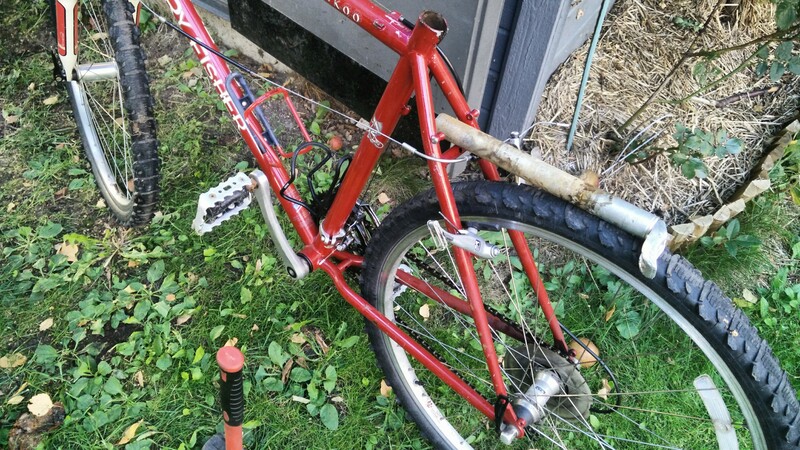 Anyway, the post was still stuck, so I tried a hydraulic jack between the top tube and seat-fastener. I only succeded in bending the seat rails, which are now in a permanent banana-shaped form. Seat is still very comfortable though! I gave up for this time and finished with some more WD40-spraying. Next day I repeated the tries from the previous day, but still failed to get the effing seatpost out. I was growing desperate. Next day I repeated the WD40-spraying. And several times again the next day and during the weekend. Next day I sprayed some more WD40 and continued with other overhaul. A few hours later I removed the seat and took out the hand-sledge. I gave the seapost a good whack into to the seat tube. It didn't move. Like at all. I gave it another better whack, and didn't it move a few millimeters just now??! Another good whack sideways to get the seatpost rotating did indeed move it around a bit. A small bit. After some more whacks back and forth, I whacked the seatpost upwards. Woo-hoo!! The post went out several centimeters! Another whack and the seatpost went flying out in the street! Upon inspection, the seatpost seemed to be quite fine despite my less than gentle work with the sledge. I ended up polishing up the post a bit and greased it up, as well as spraying some WD40 into the seat tube before reattaching the seat and post in the frame. Adjustment followed and this part is now a-okay. Some days after a lot of whacking and an abnormous amount of WD40; seatpost is out! Got a new set of pads from Biltema for the rear. At SEK 30, this was a cheap fix. Same adjustment in the front. Have a great brake-feeling now, both front and rear. Front pads will have to be replaced soonish. Unfortunately the front rim seems badly scored. This will have to be replaced sooner than later. Lubing all moving parts restored some function, but adjustments for proper function had to be done both front and rear. After a few days of riding, the front shifter suddenly stopped working. It only allowed shifting to and from the the smallest and mid chainrings. In my mind I saw money spent in a near future. Looking for a DIY-guide for broken shifters I came across this clip; https://youtu.be/AKLejn7f_Po. Yet another few days later I had to readjust the front derailleur again. I guess the wires are pretty old. A complete gear wire overhaul may be in order, but for now they're quite okay. The original headset was way to low, it didn't do my neck any favours. Also I noticed there was quite some play in the front-end. Started checking out the fork, it seemed okay so I just adjusted it for my personal preference (hardest setting for tarmac riding). Next I checked the headset. It seemed the play was mostly here. External inspection looked okay. Internal inspection not so much. Hardly any grease on the bearings and the top-nut was fastened on the tube with no play to adjust the, uh, play. Who the heck put this bike together??! Going back to Biltema website I noticed they had an adjustable stem for a fair price. I got it, installed it and set it to maximum angle. Still not high enough. Searched around on the web and found a cheapo Humpert XtasY 50 mm riser bar on sale, which I ordered as well as a five-part spacer set from Bikester. Upon arrival I installed the highest and lowest spacers and could finally tighten down the headset. No more play! As for the riser-bar, it's okay now, but I'd like some more to get city-proper ergonomics. Also the bar is wide, oh so wide! It feels like I'm flying with my arms out! Think long-horn cattle. The current un-cut width also presents some difficulties with the wire-lengths. I may have to order new wires and cable housings in a near future. Will see how a less wide bar affects this for now. Installed an unopened bicycle computer I bought years ago. No juice in the battery of course, but it's mounted now. I like techy stuff on my vehicles! Added front and rear lights. Added reflectors to the pedals. Get a battery for the bike computer. Get new front brake pads. What a relief to not having screechy grating front brakes! Rear reflector. Reclaimed the rear reflector from our youngest's now too-small 10"-bike. He's now happily biking around on his new old refurbished 16" BMX-MTB hybrid Crescent Brook. Cut the handle bar down to size. Done. Took off about two centimetres on either side. Much better now! Switched right-hand front brake to sit on the left. It makes sense for a motorcyclist, okay? Switched left-hand rear brake to sit on the right. Need a seat warmer. Preferrably a woolly one. Front tire WTB Primal Raptor, 26x2,10"
Rear tire WTB Primal Raptor, 26x2,10"